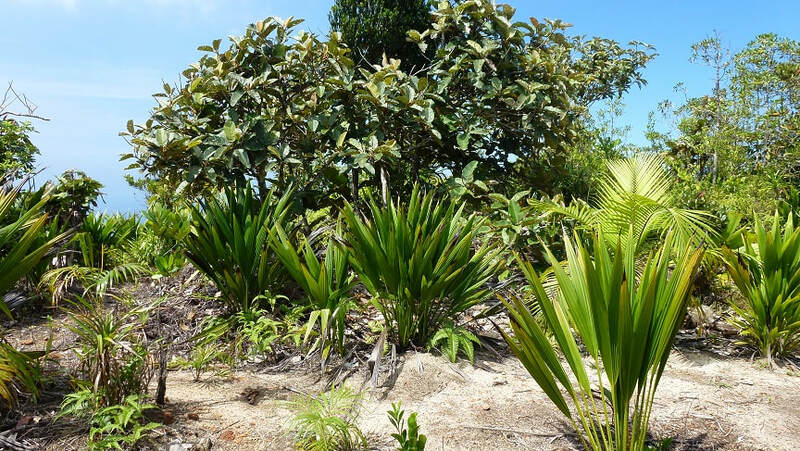 Glacis (inselberg) habitat is very diverse but threatened by invasive alien plant species. 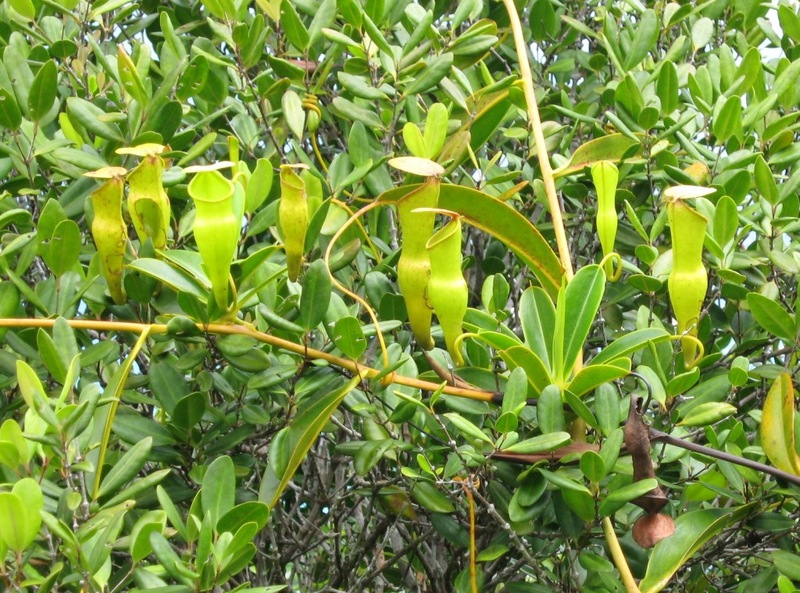 Many glacis areas have 80% or more invasive species, in spite of the harsh conditions found on glacis. Experimental restoration carried out by a PCA research scientist has shown that there can be a rapid, very positive effect on the glacis biodiversity when restored communities are maintained over an extended period. 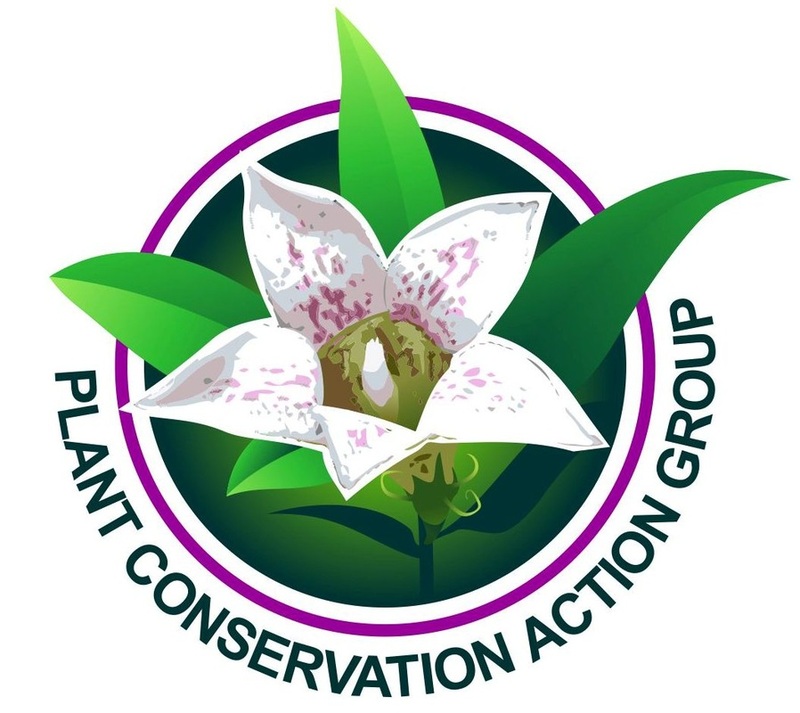 Our project has been a collaboration between PCA and the Seychelles National Parks Authority (SNPA). We also work in partnership with the Port Glaud community on Mahe. 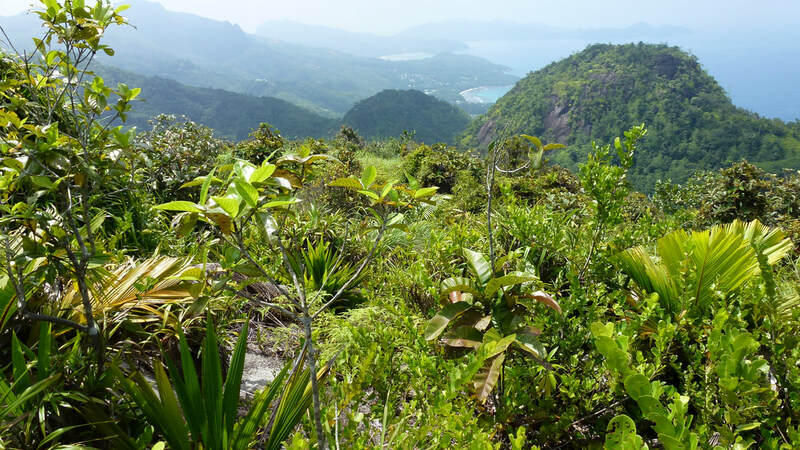 The glacis site we chose to restore lies in the Morne Seychellois National Park, not far from Morne Blanc and the Tea Factory and Tea Tavern. It is surrounded on 3 sides by cliffs. An area of 0.8 hectares had already been restored experimentally in 2011, with considerable success. 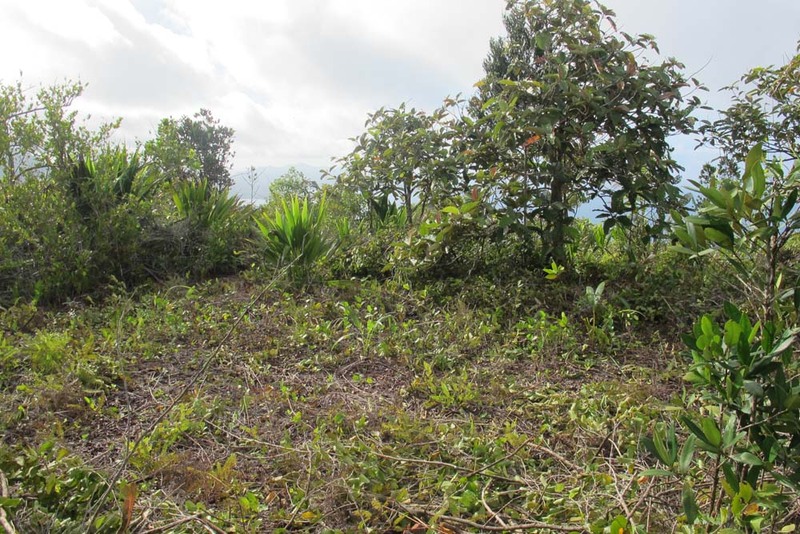 As a result of our project we were able to restore a total of approximately 4.2 ha. 1) Remove all alien plant species and replace with native species capable of natural regeneration. 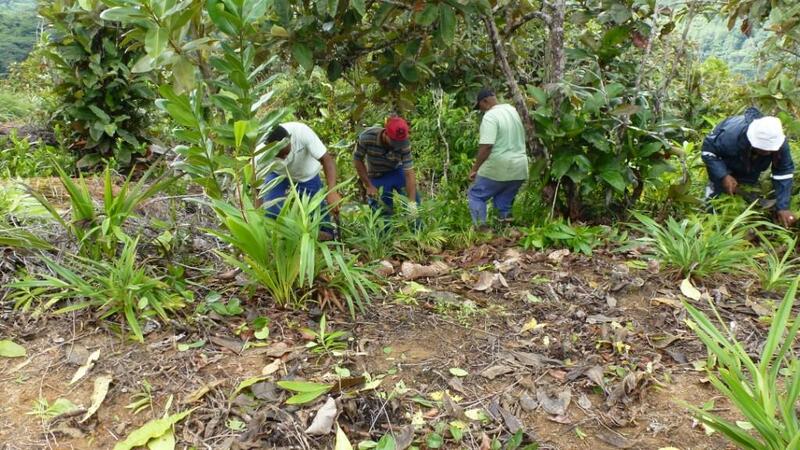 Members of the local community were offered training to raise some of the required native seedlings. 2) Members of the local community have been partly trained in the rehabilitation process and have been undertaking some of the subsequent maintenance (which is always necessary, but the work becomes less and less as time goes on!). 3) A small group of people within the local Port Glaud community has agreed to act as long term monitors and guardians of the glacis site. They will continue to facilitate its recovery, along with PCA members. 4) A short, easily accessible nature trail has been developed at the site. Information boards give local visitors and tourists who visit the site an understanding of the glacis vegetation and the restoration process. 5) A nature trail leaflet has also been printed and distributed through various tourism outlets and establishments. 6) Additionally, by 2018 it has become clear that natural regeneration of the native species is well underway. Competition from alien species has been reduced and the restored glacis habitat is able to show its true nature. SNPA staff carried out much of the initial clearance of alien species and planting of native species as it is tough and specialised work. They also carry out some of the major maintenance work, while PCA members and local community volunteers help by removing alien seedlings. In 2018, two PhD students have started further research, which will help us to learn more about the restoration process. The new nature trail winds its way through the restored vegetation. Right: Community and PCA members weeding out alien seedlings that have grown very fast! Much of the alien vegetation has been removed because it competes with native vegetation and limits its ability to regenerate. This is the same area a few years later. Native plants have regenerated by themselves, although a few have also been planted. Native plants are slow growers! Regular maintenance (removing alien seedlings and alien regrowth) is allowing the vegetation to start to look like it did long ago. Our main source of funding was the GEF-UNDP Small Grants Programme, with some extra funding from the Government of Seychelles-UNDP-GEF Biodiversity Project. This funding enabled us to carry out the important environmental conservation work which we could not support with PCA funds alone. In 2018 we received extra funds through the Seychelles Government's Corporate Social Responsibility (CSR) programme, donated by a local businessman, who wished to support our continued work at the site.